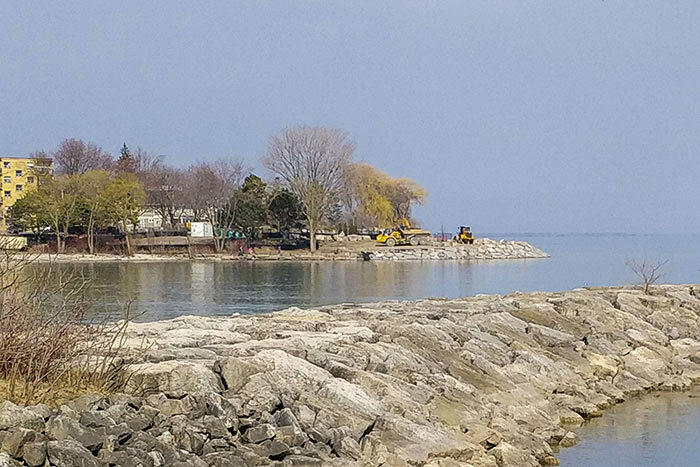 Ongoing shoreline rehabilitation at Rotary Park, as seen from Colonel Samuel Smith Park. Welcome to ccfew.org, Celebrating 30 Years of Waterfront Advocacy! CCFEW was founded to fight development proposals in the former Mimico “Motel Strip”. We spearheaded the fight to secure public access to this section of waterfront. This resulted in reduced condominium densities, and the creation of Humber Bay Shores Park. To promote a healthy waterfront environment through preservation, rehabilitation and education. To seek maximum parkland through the preservation of existing parkland on Etobicoke's waterfront, and the acquisition of additional waterfront lands for park purposes. To promote meaningful citizen involvement in decisions affecting the environment. To seek to ensure that any development or redevelopment is compatible with its surroundings in scope and scale. While the specific threats and challenges change with time, these founding objectives remain relevant today. Residential redevelopment continues to be an area of concern with increasing pressure for high density developments along the lakeshore. We continue to be actively involved with the TRCA in the creation of new parks and in the improvement & maintenance of existing ones. In order to see the benefit of protecting our natural heritage, we need to understand it. Our most significant activity in this area is our “Bird Walks”. We typically organize 10 guided walks per year in waterfront parks. These are nature walks with, as the name suggests, a primary focus on birds.